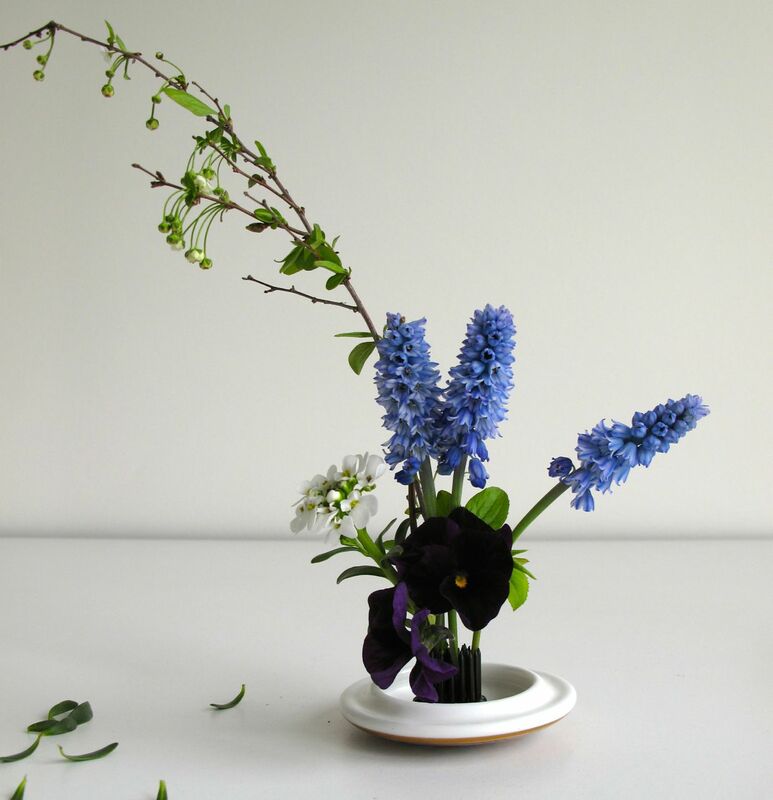 Monday brings an opportunity to practice flower arranging by joining in Cathy’s weekly In A Vase On Monday, where the only rule is to fill a vase using materials gathered from one’s garden. 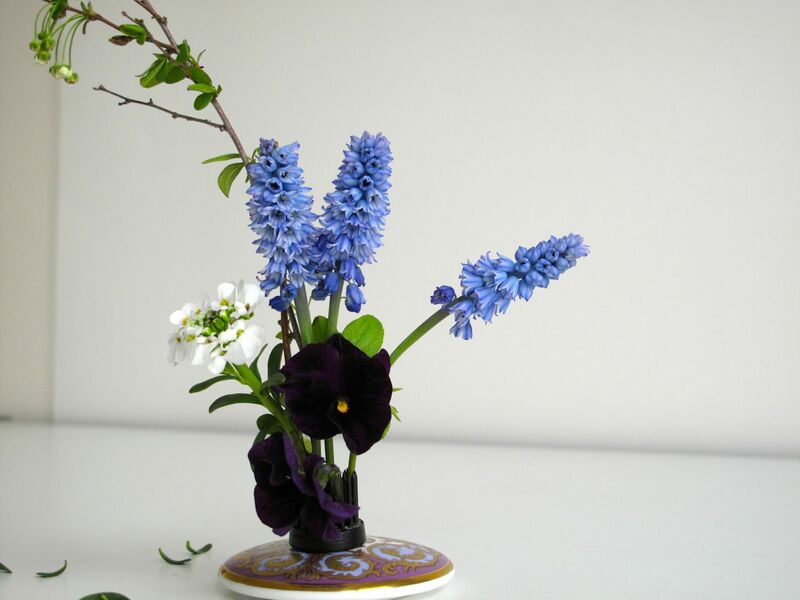 I was excited about cutting a few Azure Muscari this morning to use for my Monday vase. They have just opened in the last couple days. Though there only are 6 growing in my garden, they are so diminutive it seemed worthwhile to cut a few to enjoy close-up. Pseudomuscari azureum (syn. Muscari azureum), the azure grape hyacinth features a bright blue color with a darker blue stripe on each flower. The flowers themselves grow on densely-packed racemes. In the Pseudomuscari genus the mouth of the flowers is shaped like an open bell, rather than narrowing the way it does on Muscari. I recently bought 2 round black pin holders, very tiny, just 3/4 inch, so decided to try one out today. It was more difficult to use than expected so I will need to practice more with it. It is hard to get small stems inserted securely without damaging them. Very cute holder though. For the container I needed something flat and chose the white inside of a lid from a small round box of English bone china. The white side of the lid is visible in the very first image (the official portrait of today’s design). Later I turned the lid over and forgot to turn it back. I was experimenting after noticing the colors of the outside of the box lid might complement the flowers. Of course the top side provides no way to hold water anyway. 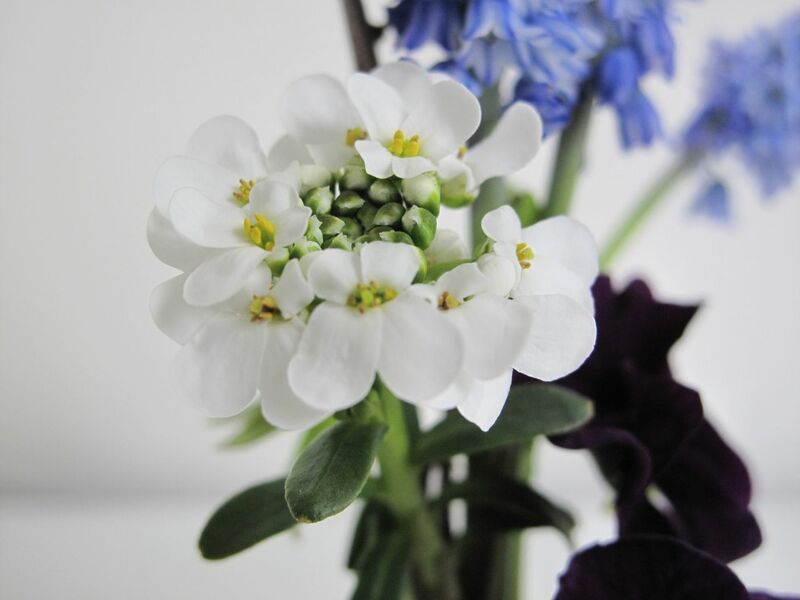 Companions for this week’s Azure Muscari are Spiraea prunifolia (bridal wreath spiraea) and Iberis sempervirens (Candytuft), both just coming into bloom, along with rich purple Viola that bounced back admirably from a cold winter in the meditation circle. A scattering of Iberis leaves help balance the design. This entry was posted in garden and tagged Azure Muscari, flower arranging, flower design, garden photography, Iberis Sempervirens (Candytuft), in a vase on monday, nature photography, Spiraea prunifolia (bridal wreath spiraea), viola on March 23, 2015 by pbmgarden. 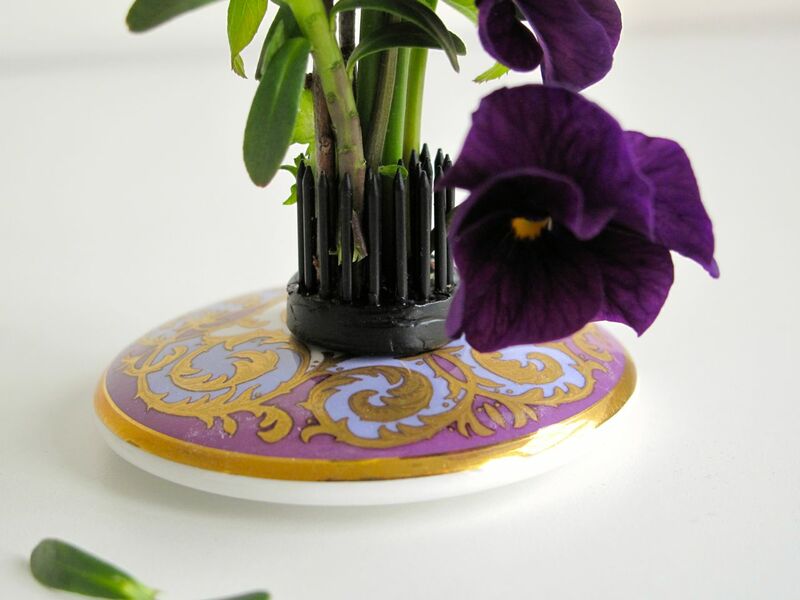 I am intrigued by how you use the pins to create such elegant designs; I must try again to buy some. The lid of the box really picked up on the colour of the viola. The pins are fun to use Christina, though they don’t work for everything. I needed a small one for an upcoming class on Small Design (8×8 inches or 20.32 c). Hope you can find some locally. I had to order this one and it cost very little, but the shipping charge was horrendous. Such a beautiful variety of flowers in this very elegant arrangement! Thank you very much. I was excited to be able to use the Azure Muscari today. That’s a sweet memory Judy. 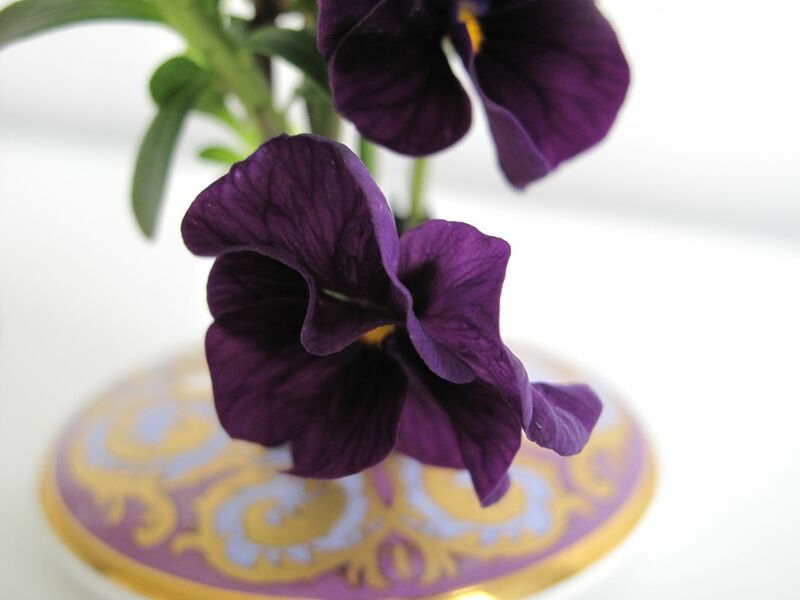 My mother liked violas too and I have a fond memory of her buying me some for my college dorm room. Just beautiful Susie – a perfect arrangement for a meditation! What a delight! And perfect against a white backdrop. Thanks Marian. I enjoyed seeing the photographers’ setup along the hike you took. I would have commented but lost my courage half-way through your post. My phobia kicked in big time. 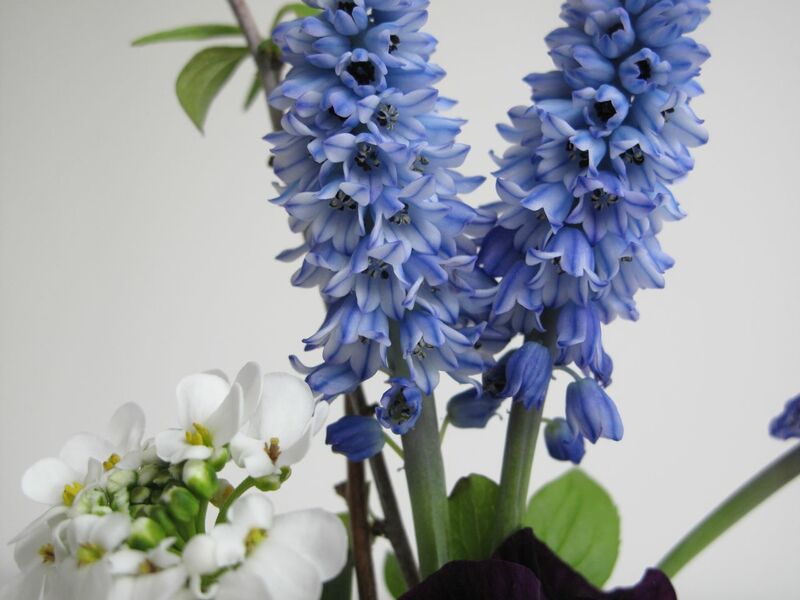 I have 2 pins but none so small….I am also intrigued how you used them….and you featured viola….love it with another favorite the muscari which is an unusual one, Azure Muscari. A bit of a cross between a muscari and a Puschkinia. A beautiful simple display with wonderful color and lines Susie! Thanks Donna. I think I read Pseudomuscari comes from Turkey. I enjoy their unusual color. As usual, Susie, you have presented a lovely arrangement. I appreciate that John. My arrangements never turn out the way I first imagine them, but they’re always fun to do. And it’s so nice to have fresh flowers in the house. Thanks Cathy. Most of my photos ended up with that lid turned the wrong way so I felt I had to explain why. Oh, well. It’s so nice to have a bit of choice as to what to display on Monday. 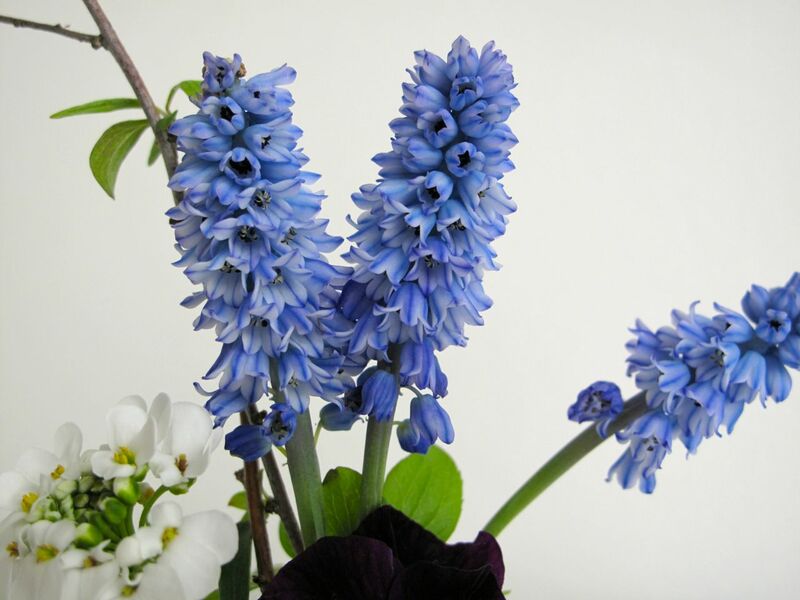 That is truly an elegant and beautiful grape hyacinth. But are all Muscari now Pseudomuscari? Or just some? It sounds kind of insulting, like they are poseurs and not genuine. Jason, isn’t it nice? Far be it from me to explain anything about how flowers are named, but from what I understand this is actually a different genus from the Muscari genus (although they are related). The tip about the bell-shaped mouth is apparently a distinguishing feature. I was surprised when I realized how small the arrangement actually was, Susie – it has a presence that reads big in photos. I love the color of the Pseudomuscari and I covet the Spirea. Wish I could send you Spirea, Kris. It’s sending out new shoots all around that I’m having to trim back. Tricks of the camera. The flowers were so tiny themselves but I tried to use them as I would larger ones. It would probably be helpful to use an object to help explain the size. The selection of flowers is lovely Susie, and your arrangement is so calming and delicate and so carefully presented – beautiful photos. The first one with the white base and background and the scattered leaves is my favourite, but the colours on the lid do go so nicely with the viola too. Cathy, I so appreciate your nice comments. Those first spring flowers are especially fun to work with–they need little adornment. I like the base turned to the white side also. Very often it’s after photographing the arrangement I can see what works and what doesn’t, but don’t usually have time to made adjustments. Very nice arrangement. The simplicity of the design showcases each flower very well. Good use of the pin frog too. 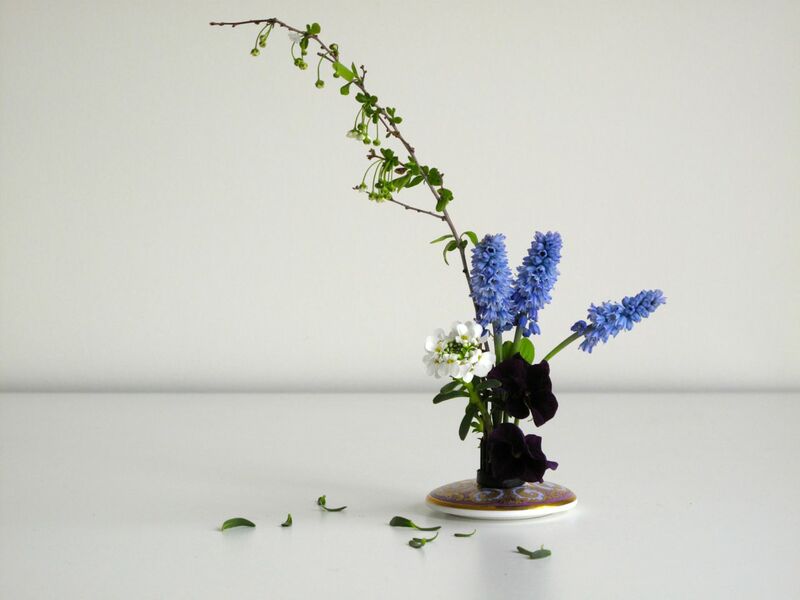 I have a few and never ever use them –however I am not as good at the Ikebana style of floral arrangement as you seem to be. Creative thinking, using the upside-down lid. Too bad those pesky flowers demand water, as the colors of the lid reflect those of the flowers beautifully. My pin frogs mostly sit unused for the reasons you note. I’m hoping to get the hang of them with practice. This post is urging me on with your stunning results. Hi Rickii. Yes, pull out those frogs and give them another try. The larger sizes (2 or 3 inches) are nice to work with, but this little one didn’t have very sharp points. Tricky. Oh the markings on the Pseudomuscari azureum are quite exquisite Susie. I clicked for a closer look. Do they self-seed and if so are they easy to keep under control? A most elegant arrangement. Hi Amy, I chose the lid on a whim, so glad it worked out. 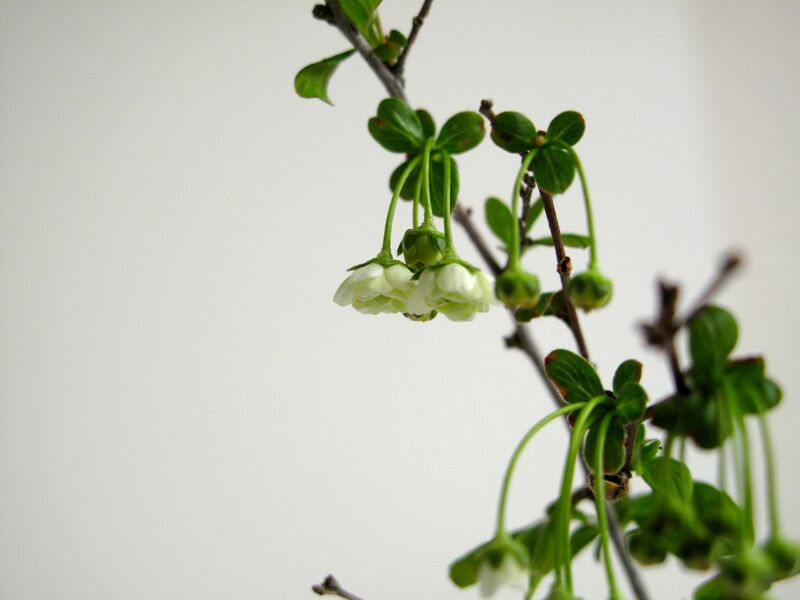 The pseudomuscari are holding up well indoors where they’re much easier to enjoy at eye-level. How beautiful. That is a very special Muscari, I love the stripe and what a very lovely shade of blue. A lovely arrangement. Thank you. That dark-blue, stripy marking on the flowers is a bonus. These were a lucky, inexpensive purchase a couple of years ago. Hope the bulbs spread. I love this arrangement – I wish I had anything in my garden right now (let alone anything that looks this nice)! Thanks Sarah! Hope your spring arrives soon. Hi pbm, I love that dark dark viola, and the elegant curve of the spirea. Thanks Linda. The spirea flowered for a very short time this year and is all leaves now. The viola is a self-seeded one from a batch a couple of years ago.